According to Russian-language records and a Tashkent party film published by Stockholm television last week, Alisher Usmanov held the hand of Gulnara Karimova and whispered intimately to her just days after the latter had been making plans to collect millions of dollars in payments from Swedish telephone company, TeliaSonera. Karimova is one of two daughters of the President of Uzbekistan, Islam Karimov; she is a leading candidate to replace him if he falls ill, or to succeed him at the presidential election due in March 2015. Karimova is also one of several targets of official investigations underway in Sweden and Switzerland, alleged to have been behind a corrupt payment system through which TeliaSonera obtained and operated its mobile telephone concession in Uzbekistan, and through which the Russian rival, Mobile Telesystems (MTS), owned by Vladimir Yevtushenkov, lost its concession and was forced out of Uzbekistan last year. The tale of that billion-dollar expropriation can be read here. Usmanov, who is Uzbek by origin, is TeliaSonera’s shareholding partner in Megafon, the London-listed mobile telephone operator and rival of Yevtushenkov in the Russian telecommunication market. Usmanov is also on the top of Rich Lists in Russia and the UK, based on estimates of his asset value in Russian telephony, iron-ore mines, steelmills, print and internet media, not counting his debts and obligations. He has been one of the more nervous of the oligarchs, ready to put up his hand to volunteer, and quick to implement the Kremlin’s marching orders. The new disclosures appear in a Swedish television broadcast of May 22. The documentary film was titled ““Telia Sonera – The Courier from Moscow”. The documentary was prepared by three reporters, Fredrik Laurin, Joachim Dyfvermark, and Sven Bergman, and broadcast by Uppdrag Granskning (“Mission: Investigation”), a regular programme of SVT, the Swedish public TV broadcaster. The source of its news can be heard, speaking on the telephone in Russian, and saying: “I have a letter for you from Moscow.” There is nothing else to substantiate the headline, or the impression of a source in or from Russia. Still, there is bad news in the Stockholm film for the Usmanov-Karimova combo; this is for reasons the Swedish investigators have not focused on. For whether or not the documentary evidence proves to be as authentic as the programme investigators believe, it may not meet the legal tests for the Swedish prosecutors and their Swiss counterparts to issue bribery and money-laundering indictments against Karimova herself, or her friend, assistant and business agent, Gayane Avakyan. One of the documents revealed, headed (in Russian) “MEMORANDUM RE: Scenario of hearing/list of questions”, appears to have been drafted by lawyers for Avakyan, their client, and may not be admissible as evidence. Even evidence of what Karimova and her agents discussed on paper wanting from Telia Sonera – Karimova says it is fake — doesn’t convict anyone at Telia Sonera of agreeing, let alone of making corrupt payments. Also, the time period covered by the new disclosures – July through September 2012 – comes after the transaction record which has been the focus of the Swedish and Swiss investigations so far. 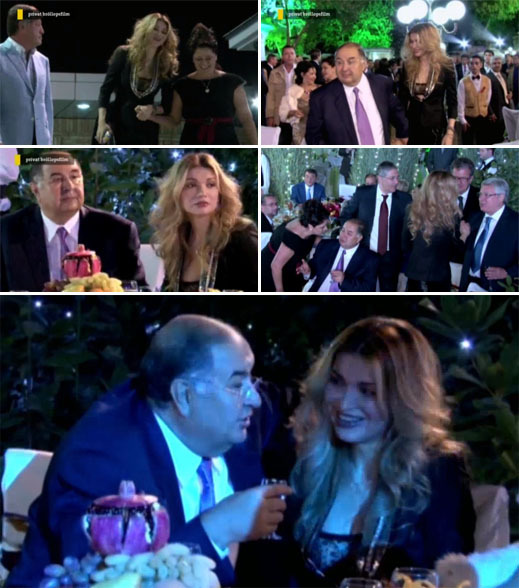 The film within the film, however, recording Usmanov with Karimova at a wedding party in Tashkent last September, may be enough to derail the political succession plan in Uzbekistan which she admits to hatching, but he denies he has been financing. Exactly whose intention or benefit is served by exposing the two of them in this way isn’t clear, because the source of the Tashkent party film isn’t revealed. The Swedish reporters do not provide details of the film source, nor will they say whether it came with the documents. They are not disclosing how much more of the film they are holding, which has not been broadcast to date. What is suggested by the combination of disclosures is an operation by an intelligence agency with bigger political aims than the commercial interests at stake in who makes money out of Uzbek mobile telephones. That agency may be Russian; it may be the Americans, or their Swedish allies. The involvement in the Swedish television documentary of what is described in the website notes as “a team of journalists from Radio Free Europe (RFE) and Radio Liberty (led by Alisher Sidikov)” pinpoints the US Government and its services, which own and control the two radios. An RFE/Radio Liberty posting ahead of the Swedish TV broadcast can be read here. Unlike the Swedish version, the RFE/Radio Liberty story makes no claim there was a Moscow or Russian origin for the documents, and it makes no mention at all of the Tashkent party film. The absence from the production notes of Russian experts in Russia or Uzbek experts in Uzbekistan adds to the impression that the source of the material, including the Tashkent wedding-party film, is western, not Russian, and that the impression of Russian source, courier and postman is camouflage. Here are the original documents which are the focus of the television programme, plus translations from Russian into Swedish and English. Here too is the English translation of the programme’s running script. Why would an intelligence agency go to this trouble? Again, the film within the film may be more significant than the documents. Someone wants the personal links between Usmanov and Karimova to become visible – much more visible than Usmanov wants to admit. According to the Swedish reporters at Uppdrag Granskning, the Stockholm prosecutors currently investigating TeliaSonera, Gunnar Stetler and Berndt Berger, are not susceptible to influence from the Swedish government or its agencies, and their authority protects them from interference from the Swedish intelligence services. The reporters believe, though, that Stetler and Berger want more time for their investigation, and will apply for another extension when the deadline for reporting indictments to the court expires on July 25. According to the American version from RFE/Radio Liberty, the documents “show TeliaSonera being asked to pay hefty bribes in exchange for protection from government agencies and an infusion of new clients. They also appear to show Karimova personally dictating the terms of the negotiations through a series of scribbles, complaints, and queries… One of the documents, a point-by-point summary of business negotiations with TeliaSonera during the summer of 2012, appears to have been drafted by a Karimova aide for her review. Among other things, the document notes TeliaSonera’s ‘confirmation’ that it will pay a one-off fee of $5 million in exchange for 2 million new mobile-phone subscribers. What is the relevance to these charges of the Tashkent wedding-party film leaked to the Swedish investigators? According to them, the party film they obtained has been authenticated. Reuters, which visited Usmanov for an interview at his home in Moscow shortly after the party, confirmed the date because Usmanov had done so. Other media reports have indicated the party celebrated the wedding of a young member of the Usmanov family with a young member of the Karimov family. Why then have Usmanov and his London lawfirm Schillings been taking painstaking care to remove all published trace of the party, and of what Usmanov did there? For one thing, this is what one media report claimed Usmanov had said in a toast to Karimova: “I have always financed all activities of Gulnara Karimova, and will continue to do so.” All trace of this remark has disappeared from the internet as if it had never been said. A lawyer for The Times has confirmed that Usmanov had threatened to sue the newspaper unless the report was removed. In February of this year, this threat was still in negotiation, the Times lawyer conceded, adding “Allan Dunlavy at Schillings is acting for Mr. Usmanov…It would not be appropriate to provide you with information about the nature or specifics of Mr. Usmanov’s complaint. You may wish to ask Mr. Dunlavy.it would not be appropriate to provide you with information about the nature or specifics of Mr. Usmanov’s complaint.” Dunlavy refused to answer questions. Shortly after this report appeared on the affair on February 5, the original Times story disappeared. Now that the film has surfaced, and lip-reading experts can substantiate what Usmanov was saying to Karimova, before he toasted her, according to the disappearing media reports, it appears that Usmanov was backing Karimova for her campaign to succeed her father as president. If that is what Usmanov is still doing seven months later, it is near-certain he isn’t keeping the fact secret from the Kremlin. Or is he? Is Kremlin strategy for the Uzbek presidential succession to back Karimova, with Usmanov in control of the purse-strings, despite the damage Karimova has inflicted on Yevtushekov and the MTS telephone concession? Or is the Kremlin aiming to find an alternative candidate for the presidency and rely on Usmanov to keep Karimova sweet, as he seemed to be doing in the film? No answers are likely from Russian officials handling Uzbekistan at the moment. Nor will the US and other governments with an interest in the outcome of the Uzbek presidential succession acknowledge what outcome they favour; and if not Karimova, who. After the party film surfaced last week, the Times legal department was asked to say, yes or no, whether the claim represented by Schillings, which Usmanov had brought against the Times, was still “live”; whether the terms of settlement included agreement to remove the November 12, 2012, article; and whether the newspaper accepted there was no party, as reported in the article which has disappeared? The Times refuses to reply.